Scientists led by Daigo Shoji from the Earth-Life Science Institute (Tokyo Institute of Technology) have shown that a type of artificial intelligence called a convolutional neural network can be trained to categorize volcanic ash particle shapes. Because the shapes of volcanic particles are linked to the type of volcanic eruption, this categorization can provide information on eruptions and aid volcanic hazard mitigation efforts. Volcanic eruptions come in many forms, from the explosive eruptions of Iceland's Eyjafjallajökull in 2010, which disrupted European air travel for a week, to the Hawaiian Islands' relatively tranquil May 2018 lava flows. Likewise, these eruptions have different associated threats, from ash clouds to lava. Sometimes, the eruption mechanism (e.g., water and magma interaction) is not obvious, and needs to be carefully evaluated by volcanologists to determine future threats and responses. Volcanologists look closely at the ash produced by eruptions (e.g., Fig. 1), as different eruptions produce ash particles of varying shapes. But how does one look at thousands of tiny samples objectively to produce a cohesive picture of the eruption? Classification by eye is the usual method, but it is slow, subjective, and limited by the availability of experienced volcanologists. Conventional computer programs are quick to classify particles by objective parameters, like circularity, but the selection of parameters remains the task because simple shapes categorized by a single parameter are rarely found in nature. Enter the convolutional neural network (CNN), an artificial intelligence designed to analyze imagery. Unlike other computer programs, CNN learns organically like a human, but thousands of times faster. The program can also be shared, removing the need for dozens of trained geologists in the field. 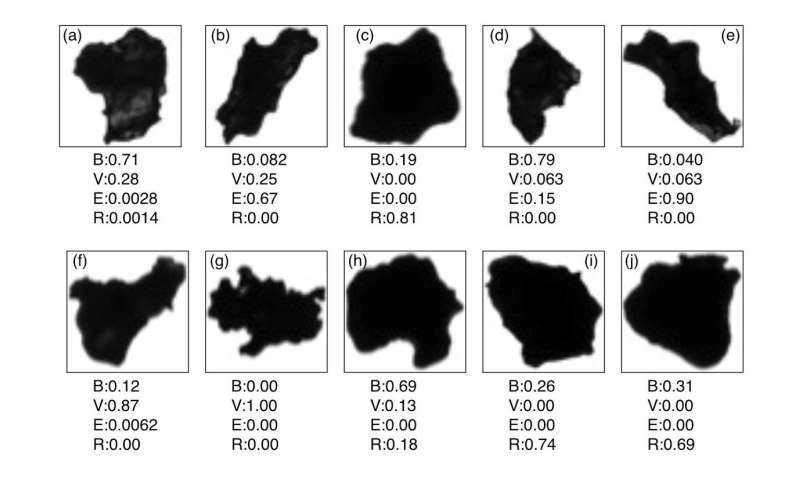 For this experiment, the program was fed images of hundreds of particles with one of four basal shapes, which are created by different eruption mechanisms (examples are shown in Fig. 2). 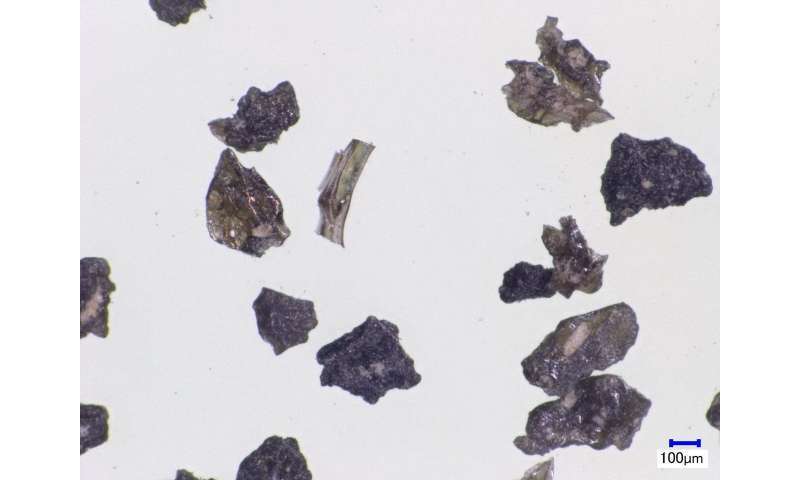 Ash particles are blocky when rocks are fragmented by eruptions, vesicular when lava is bubbly, elongated when particles are molten and squished, and rounded from the surface tension of fluids, like droplets of water. 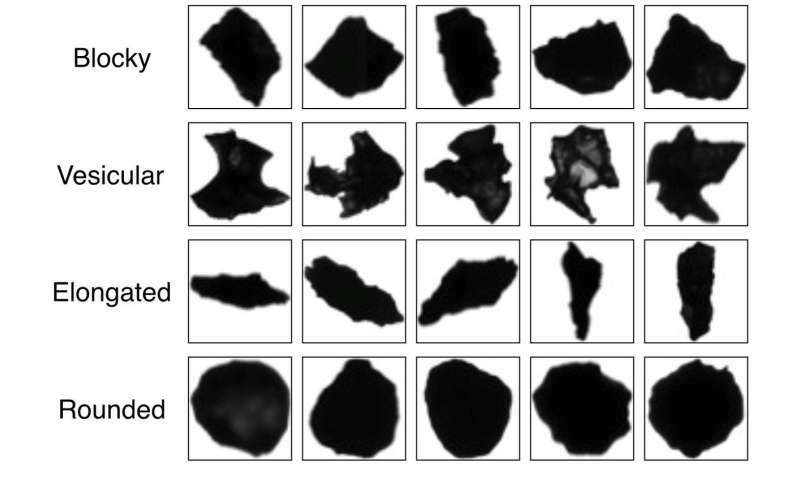 The experiment successfully taught the program to classify the basal shapes with a success rate of 92 percent, and assign probability ratios to each particle even for the uncertain shape (Fig. 3). This may allow for an additional layer of complexity to the data in the future, providing scientists better tools to determine eruption type such as whether an eruption was phreatomagmatic (like second phase of Eyjafjallajökull eruption in 2010) or magmatic (like flank eruptions of Mt. Etna). Dr. Shoji's study has shown that CNNs can be trained to find useful, complex information about tiny particles with vast geological value. To increase the range of the CNN, more advanced magnification techniques, such as electron microscopy, can add color and texture to the results. From collaboration with biologists, computer scientists and geologists, the research team hopes to use the CNN in new ways. The microcosmic world has always been complex, but thanks to a few scientists studying volcanoes, answers may be easier to find.